QRCA was lots of fun and we had a great time seeing old faces and meeting new ones. Many of you gave us your business card for the chance to win the beautiful Coach bag. 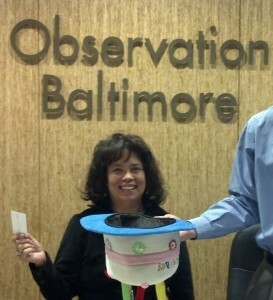 Once we got back to Baltimore, we took a funny looking hat, shuffled the cards around, and picked one lucky winner. We are happy to announce that the winner is Jeff Etherton from Ipsos. Congratulations, Jeff! We will be shipping the bag to the address on your card in a few days. Thank you again to all of the organizers of QRCA for running a terrific event and thanks to everyone who attended and made it a great one! This entry was posted on Wednesday, October 23rd, 2013 at 6:11 pm. Both comments and pings are currently closed.